Motorcycle accidents don't always involve other vehicles. Sometimes it's the roads we travel that cause crashes. Maybe the road was poorly designed or it wasn't maintained properly. Who is to blame? That's our job to find out. 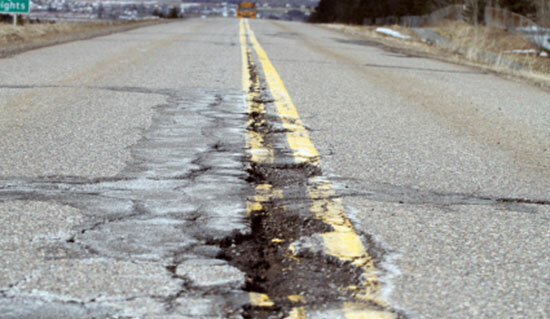 Whether it's deep ruts, potholes, uneven surfaces, debris, or other obstacles, dangerous road conditions lead to serious crashes and severe injuries. If you believe unsafe road conditions lead to your accident, you may have a case for compensation. Call us for a free consultation at 1-866-943-3427, and we'll help determine your best course of action after a motorcycle accident. These unsafe road hazards can lead to devastating accidents, especially for motorcycle riders. If you think these conditions – or any others – led to your motorcycle accident, contact us today. Time is critical as evidence disappears quickly. Dealing with an accident is overwhelming. Not only are you suffering pain from your injuries, but you struggle with medical bills and lost time at work. At our law firm, we handle the hassles, so that you can focus on getting better. We can answer your legal questions and more. Just call us for a free consultation at 1-866-943-3427, or speak with us online by filling out the form in the top right corner of this page. You can chat live with one of our representatives by clicking on the box in the bottom right corner. Insurance companies can often bully injured motorcycle victims into small settlements that don't fairly compensate you for medical bills, lost paychecks, and more. That's where we can help. We don't back down, and we don't quit until you've recovered the money you deserve. Since 1982, we've been helping people like you recover fair compensation. Experience matters when you're dealing with aggressive insurance companies. Don't hesitate to get the legal help you need after an accident. We're standing by 24/7, and we're ready to get to work.